We love when people write book reviews for us! 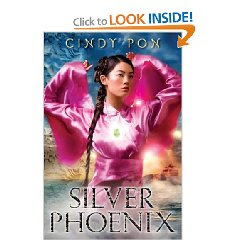 Thanks to local illustrator Elizabeth Dulemba for her review of Silver Pheonix by Cindy Pon. readers won't be familiar with (and therefore sounds new) - the protagonists travel to the lands of the 'gods'. Basic plot: Ai Ling's father travels to the palace but never comes home. An older man tries to rope Ai Ling into a marriage she knows her father would never agree to, so she leaves to search for her father. She ends up meeting and traveling with Chen Yong - a young man of mixed descent. During their journey magical creatures and demons seem intent on stopping them. But Ai Ling has a magic amulet that protects her and a budding skill to enter people's souls, making it possible to read their minds or defeat them. While visiting the gods, she learns that the Emperor's counselor was in love with Ai Ling in a previous life and is still intent on marrying her. He's managed to cheat death for generations by stealing souls. Ai Ling must defeat him to free her father. think it might be a good hand-sell for older readers who loved the Riordan books or other fantasy books."